Burns, R. 2018. Modular Machine Knitting 1. Photograph. Having worked on modular hand knitting in the previous module, I was keen to continue exploring this method. I thought I could probably replicate this technique on the knitting machine quicker than hand knitting, and at a finer gauge. The Knit 1 book 'Learn Creative Techniques' has a tutorial for a patchwork garment, which I loosely followed. I knitted a triangle on the machine, which I cast off then rehung on the machine along one of the edges. I then knitted with a differnt yarn and made another shape. This can be repeated until the desired shape is required! I thought this could possibly be made into a dress, but I'm not sure if this would appeal to my target audience and might also be quite difficult to shape into a dress. 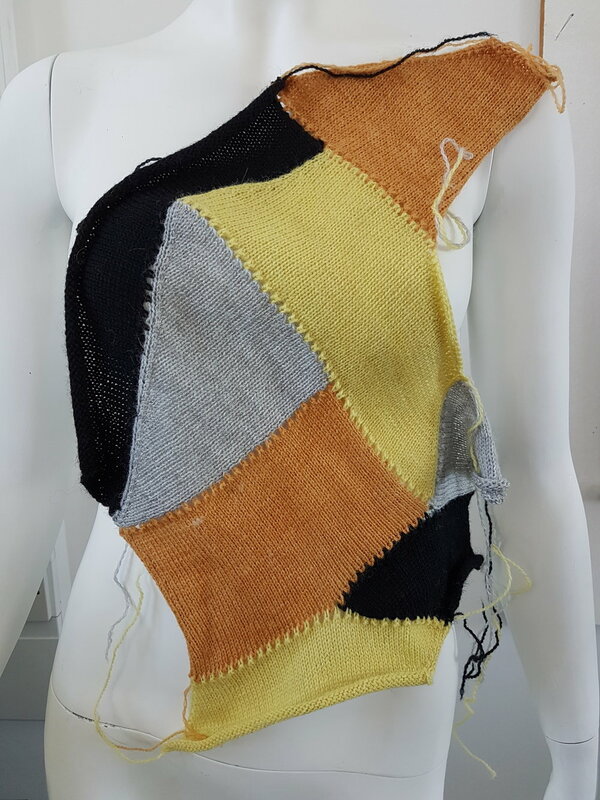 The images below show the swatch I knitted and how it could potentially be draped onto the body. Perhaps a looser fit garment such as a jumper would be more suitable? Burns, R. 2018. Modular Machine Knitting 2. Photograph. Burns, R. 2018. Modular Machine Knitting 3. Photograph. Whatever I choose to make with this technique, I would result in a unique item as I don't follow a pattern. I think it would be useful to have a paper pattern as a guide for the desired outcome e.g. a scarf/wrap so that the final shape was rectangular rather than completely random. It's also a great way to use up ends of cones of my naturally dyed yarn. By using the neutral base yarns and incorporating flashes of dyed yarn, I would be ensuring oddments of yarn don't go to waste, but also produce an object that is wearable. I'm looking forward to developing this technique and seeing how easy of difficult it would be to produce an item that fits a pattern, yet remains random and unique! Burns, R. 2018. Modular Machine Knitting 4. Photograph. Knit-1. 2010. Learn Creative Techniques. Brighton: Fashion Textile Publishing.